Discover the innovative design of the Ella Outward Swing Door Walk In Tubs. Engineered for durability, safety, and comfort, these acrylic walk-in bathtubs feature a fiberglass-reinforced shell with a stainless steel frame. Our Outward Swing Door Walk In Tubs are the ideal choice for roomier bathrooms or for bathers with unique needs. When shopping for an Ella Outward Swing Walk In Tubs, pay attention to existing bathroom fixtures so the door can open freely without obstructing other objects. 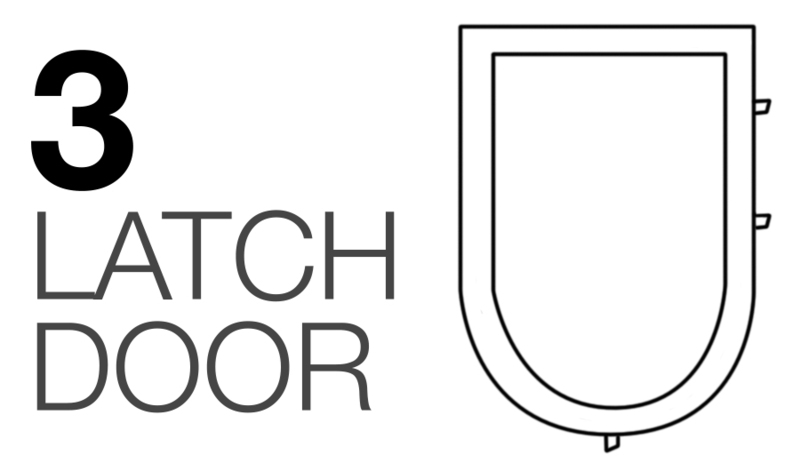 The high-quality and uniquely designed 3-latch door lock system surpasses competitors’ standard 1-latch door lock for guaranteed secure and waterproof closure. The gravity-driven Dual Drain Technology outperforms the 1.5” industry standard single walk-in tub drains for reliable, fast, and efficient drainage. Ella Outward Swing Walk-In Bathtubs are jetted and assembled in Chicago with UL certified parts supplied by NuWhirl, a California-based company. The Outward Door Walk In Tub models range from the compact Slim, the narrow and elongated Lounger, the standard-size Malibu, an extra-wide Monaco, a two-seat Tub4Two, and the largest two-person walk-in tub available on the market, the Big4Two. We offer numerous jetting options like soaking, therapeutic air and hydro massagers, soothing foot massagers, and the revitalizing and exfoliating Infusion™ Microbubble Therapy. Choose from packages offering premium features like alternating color LED chromatherapy for mood enhancement, aromatherapy to calm and stimulate your senses, radiant heated seat(s) and backrest(s) for a comfortable experience as the walk-in tub fills or drains, and the chemical-free, earth- and bio-friendly ozone sterilization that kills bacteria while the walk-in tub is in use. Our standard anti-scald Thermostatic Control Valve is perfect for safety-conscious consumers and in commercial applications where it’s required by code, or you can choose a fast-fill faucet in a contemporary or classic style. Ella Outward Swing Walk In Tubs offer helpful safety features like a textured slip-resistant floor, low step-in threshold, grab bar(s), and 17” high ADA compliant seats. Browse through our product pages to find out more information and a package that’s right for you. PC & tempered glass outward swing door with gear and shaft mechanism with 3 latch door locking system to assure equal pressure on the door gasket and the leakproof door seal. Our competition also offers a lever door lock system that allows only one latch vs. Ella 3 latch door lock. Ella gravity driven 2″ dual drain technology with independently operated 2 openers, 2 overflows for fast and reliable drainage and exit out of the walk-in tub. The Monaco is made with an extra-wide seat to accommodate larger body types or those who simply want a roomier tub interior. Like our other outward swing walk-in bathtubs, this stylish design can complement practically any bathroom. The Malibu is our most popular outward swing door walk in tub and is made with common dimensions to suit the average-sized bather. The stylish outward swing door with a 3-latch door lock system and low threshold allow for an easy entrance and exit. Taller bathers can kick back with the additional legroom and hamstring support in this Lounger Walk-In Bathtub. Engineered to save space with a 27” narrow width body, the Lounger doesn’t sacrifice your comfort with its 19.5” wide seat. Make the most out of your space with the Ella Mobile, a 45” long, walk in tub that can easily replace most common standard size bathtubs. This walk in tub provides a more compact bathing solution for smaller bathrooms. Make the most out of your space with the Ella Front Entry, a 40” long, walk in tub that can easily replace most common standard size bathtubs. This walk in tub provides a more compact bathing solution for smaller bathrooms. Thanks to the smartly designed Slim model, you can bask in an Ella’s Bubbles Outward Swing Walk In Tub in a modestly sized bathroom. Even though the Slim has a narrow body, you’ll have a 19” wide, roomy seat that makes for a relaxing bath. Ella Acrylic Transfer Wheelchair Accessible Walk In Tubs. *Suggested water heater size for a household with only a single bather. A household with any additional bathers should consider the next size available water heater. **Approximate Drainage Time is under ideal plumbing conditions, your drainage times may vary.